This Map can withstand some magnification, so blow it up! Sonora Pass is a significant break in the Long Trails between Lake Tahoe and Tuolumne Meadows. Sonora Pass is a crossroads of trails, with the Saint Marys Pass Northbound Trailhead of the Tahoe to Yosemite Trail situated about a mile West of Sonora Pass. Hikers South on the TYT can hike the mile East up Highway 108 to switch over to hike the Pacific Crest Trail route South into Emigrant Wilderness through Sonora Pass. Otherwise TYT hikers gotta hitch-hike down to Kennedy Meadows Pack Station to continue South on the Tahoe to Yosemite Trail. But that is a pleasure, as Kennedy Meadows is one of my favorite rest and resupply spots between Tahoe and Whitney, as well as a vital resupply spot for all long distance High Sierra Backpackers. It's value for long distance backpackers is that it accepts UPS resupply shipments for long distance backpackers. I would not walk Highway 108 down to Kennedy Meadows. This a a very narrow, very twisting road around steep and deep corners with a range of Summertime tourists that make walking down downright dangerous. I'm split on which is the "best" route South, the PCT or the TYT. Both are stunning, but in different ways and for different reasons. I suggest hiking both the Summit Creek route South from Kennedy Meadows Pack Station on the TYT and the PCT route over Leavitt Peak into both the Emigrant Basin and the West Walker River drainage. Though the PCT enters the Emigrant Wilderness South of Sonora Pass, it defines its Easternmost boundary across Leavitt Peak. As soon as we drop down off the South flank of Leavitt the PCT turns East out of Emigrant Wilderness down Kennedy Canyon into the Toiyabe National Forest to trace a route around the Sierra Crest across the High Emigrant Basin. That's a good thing; routing the PCT around the High Emigrant keeps it much quieter up there. Hikers can continue South from the top of Kennedy Canyon over Big Sam to join the Tahoe to Yosemite Trail at the trail junction under the West flank of Grizzly Peak. Independent of which route we take, they all end up joining together at the top of Jack Main Canyon in the Northwestern corner of Yosemite National Park. Each route South across (or around-in the case of the PCT) Emigrant Wilderness is stunning. The map above is designed to stimulate you to craft great Southbound loops from and back to one trailhead along Highway 108, or from one trailhead to another, such as hiking from Kennedy Meadows Pack Station to Sonora Pass. There are three good ways to cook that goose. This can be executed quickly, via Kennedy Lake to the PCT at the top of Kennedy Canyon, finishing the trip by hiking South over Leavitt Peak to Sonora Pass. This route can be extended via Relief Reservoir, Brown Bear Pass, and Big Sam to Leavitt Peak and out at Sonora Pass. This concept can be taken a step further, and your hiking loop extended to a greater circumference by hiking from Brown Bear Pass over to Bond Pass. From Bond Pass a mostly downhill hike Northeast brings around the West Walker River drainage where we can exit through Leavitt Meadow down on the Eastern Flank of the Sierra Nevada, or continue North along the PCT route to Sonora Pass. Backpacking trips Southbound from Highway 108 can provide years of excellent trips bouncing between and around the Kennedy Meadows, Sonora Pass, Leavitt Lake, and Leavitt Meadow Trailheads. Northbound hikers on the Pacific Crest Trail almost always resupply at Kennedy Meadows. This is because Kennedy Meadows almost perfectly splits the roughly 150 mile distance between Tuolumne Meadows and Lake Tahoe. I strongly suggest resupplying at Kennedy Meadows as opposed to Bridgeport. I like to think that I never miss anything, but just find new hikes to explore tomorrow. Both the TYT and PCT routes North to Kennedy Meadows and Sonora Pass respectively, from the top of Jack Main Canyon, are awesome. The routes of the Pacific Crest and Tahoe to Yosemite Trails North of Sonora Pass have two nice connector trails located along Disaster and Boulder Creeks. These connecting trails mean you can hike great backpacking loops tying together segments of the TYT and PCT North of Sonora Pass in the Carson Iceberg Wilderness, just as you can do in the Emigrant Wilderness to the South of Sonora Pass. We can hike North out of Sonora Pass along the Pacific Crest Trail to either the Boulder Lake or Disaster Creek connector trails to turn Southwest towards the Tahoe to Yosemite Trail. There is only one problem with this backpacking loop plan: The last 6 miles of the Tahoe to Yosemite Trail North of Saint Marys Pass Trailhead progressively deteroriate from unmaintained trail to no trail at all. There is a route through there, but you must chart it yourself. This tends to make PCT to TYT loops North of Sonora Pass difficult. Not to worry, there is a solution for this problem, if not a perfect solution. Both the Disaster Creek and Boulder Lake connector trails have trailheads on or near the old paved Clarks Fork Road off of Highway 108. The Clarks Fork Road cuts off of Highway 108 about 18 miles West of Sonora Pass. This road access gives us the option of ending backpacking trips North from Sonora Pass along the Clarks Fork Road which puts our end point within a reasonable distance of our starting point even if we can't hike a complete loop back to Sonora Pass via the Tahoe to Yosemite Trail route. Unless you are ready for the last nine miles of rough unmaintained trail and cross-country hiking. Check out the detailed 7.5 minute topo hiking map of the last 4 miles of the Tahoe to Yosemite Trail to Saint Marys Pass. 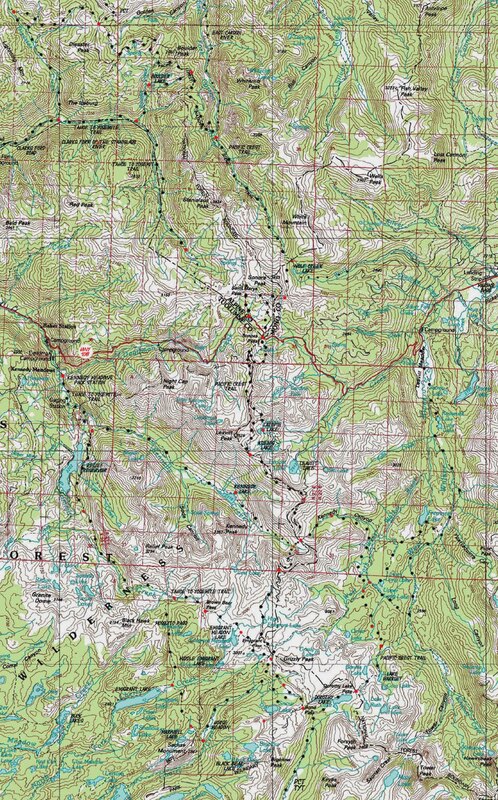 Click the red dots along the route for the images, videos, and trail guide information. Underlaying the red dots along the routes depicted on the big general map above are the trail guide pages for those locations. Clicking the Black Dotted trail route brings you to the detailed hiking map for that section of trail. These maps and trail guide pages are interlinked with miles and elevations pages for each section of the trail designed to give you a big-picture view to stimulate and inform your hiking plans and decisions. Click the red dots to go to that position's trail guide page. Click the black dots for detailed maps. Road Map specifying locations of key North Sierra Trailheads along the Tahoe to Yosemite and Pacific Crest Trails. Center and magnify the map on Tuolumne Meadows to locate the relative positions of the TM Post office, Store, Cafe, backpackers Camp, and permit office. We also locate Crane Flat to the West on Highway 120 and Lee Vining and its resources on the Eastern end of Highway 120 on Highway 395. North on Highway 395 we locate Bridgeport and its access into the North Yosemite Backcountry through Twin Lakes on the edge of the Hoover Wilderness. Continuing North on 395 we turn West on Highway 108 to find access Points through Kennedy Meadows and Sonora Pass into the North Yosemite Backcountry via Emigrant Wilderness on the classic routes of the Tahoe to Yosemite and Pacific Crest Trails. You can then download the whole USGS selection of maps and view them on the free adobe reader.